Not only did then-Richwoods junior Matt Elliott regain the IHSA title in the 100-yard breaststroke in February 2010, he did it by breaking a 26-year-old state meet record twice within 24 hours, going :55.23 in the preliminaries and lowering the mark to :54.74 in the finals. By collecting his third title in as many years in the 200 individual medley and winning his second championship in the 100 breast, Elliott stayed on track to become the first boys swimmer to win seven IHSA individual titles. Between his date with IHSA destiny in February 2011 at New Trier High School in Winnetka, Elliott picked up his second USA Swimming junior national title in the 200-meter breast in August at Irvine, Calif.
As a member of the National Youth Team, Elliott also had the privilege of representing the U.S. in 18-and-younger meets in Barcelona, Spain and Hawaii. The first inductee selected by the newly-formed "Old Timers Committee", Mark Harper won 11 varsity letters in four sports at Peoria High School (Central) in the 1920's before signing a professional basketball contract with the Chicago Bruins. As a track star for the Lions, Harper was a shotputter and consistently went over six feet in the high jump; his athletic reputation grew while playing tackle in football, first base in baseball, and center in basketball. A six-footer at age 13 who would stand 6-foot-4 inches as a high school sophomore, Harper helped Central earn a third-place finish in the 1922 state high school basketball tournament. 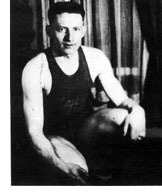 He played semi-pro basketball for several area teams prior to signing an American Professional Basketball League contract in 1924 for $400 a month with the Chicago Bruins, a team owned by the legendary George Halas who traded him in 1927 to the Washington D.C.'s (later known as the Brooklyn Visitations). In 1930, he joined the Fort Wayne Hoosiers, who went on to capture a divisional title only to lose in the league championship game to the New York Celtics on Nat Holman's last second shot. From 1931 until 1935, the final year of his professional basketball career, Harper toured with the House of David Independent Professional team out of Benton Harbor, Michigan. He has been a Rock Island railroad retiree since 1969.